To print your documents simply tap the Print option under the Documents menu at the top left of the window. The document will download as a PDF which you can then print. 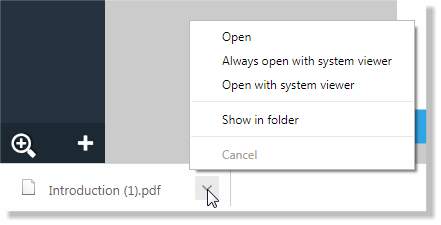 You should be able to find the PDF in your system's downloads folder. 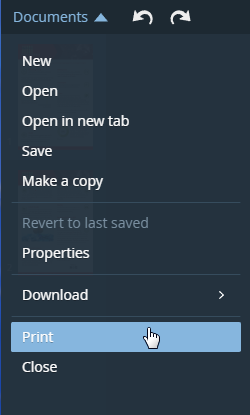 This is how the PDF download instruction looks in Chrome - other browsers will be similar. The PDF which is downloaded is the same as that provided by the Commercial Printing setting on the PDF Download options (see Download > PDF). This includes the features required for generating PDF/X documents suitable for submitting to a print company. For email or web download - Fine for distributing PDF documents through e-mail and the web. You can be sure your documents will be viewed exactly as you intended and all images are medium resolution suitable for inkjet printing and viewing on screen. High quality - Provides full fidelity at high resolution. Suitable for printing on inkjet printers or viewing at high zoom.